Sunday October 14, 2018 – 11:00 a.m. – 5:00 p.m.
Monday October 15, 2018 – 12:00 p.m. – 4:00 p.m. 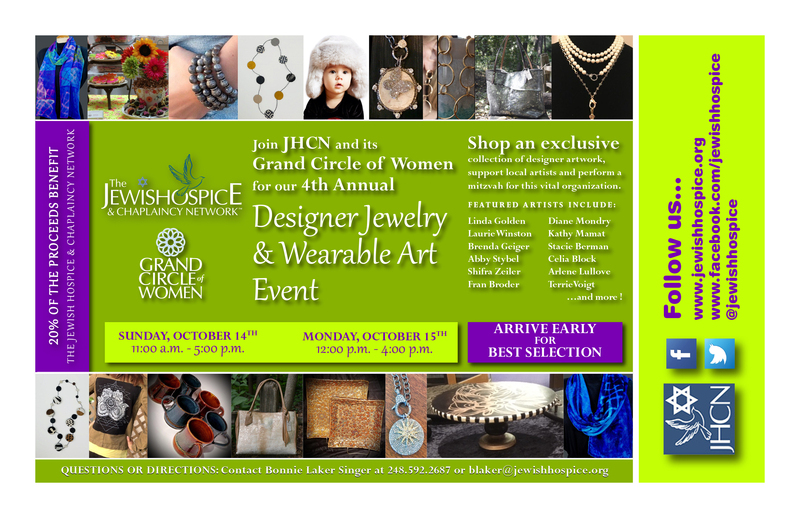 The Jewish Hospice & Chaplaincy Network (JHCN) is the beneficiary of the fourth annual Wearable Art and Jewelry Event at the studio of artist Linda Golden, scheduled for October 14-15, 2018. More than 200 shoppers supported the 2017 event, which has raised more than $20,000 in donations benefiting The Jewish Hospice and Chaplaincy since its inception in 2015. 2018’s featured artists include: Hostess Linda Golden, Stacie Berman, Celia Block, Fran Broder, Brenda Geiger, Arlene Lullove, Kathy Mamat, Diane Mondry, Abby Stybel, Terrie Voigt, Laurie Winston, and Shifra Zeiler. This talented group of dedicated artists will donate 20 percent of the two-day events’ proceeds as a mitzvah to support JHCN. A wide gamut of spectacular pieces will be on display and for sale, including: metal, vintage and beaded jewelry creations, handmade silks, vegan handbags, traditional leather bags, jewelry creations, refurbished shirts, flannels and jackets, ceramics, gift sets and decorative home goods, and even edible art. For information on this event call JHCN at 248-592-2687 or e-mail Bonnie Laker Singer at blaker@jewishhospice.org. Linda Golden, a renowned interior designer practicing in Michigan, Florida and Arizona, was introduced to jewelry design 15 years ago, and a passion was born. Her work is featured at the Whitespace Collections Gallery in West Palm Beach, and regularly appears at Art-Palm Beach and Art Wynwood-Miami. Linda’s works includes one-of-a-kind, mixed-media pieces created in collaboration with jewelry designer Jane Levy and are found in many private collections throughout the country. Stacie Berman is an exceptional theme cookie and cake designer, preschool teacher, mom and wife. Celia Block transforms the old and the ordinary into extraordinary. An interior decorative painter since 2000, Celia has expanded her practice to create hand-painted home décor items including furniture, table top accessories, glass pieces and floor cloths. Fran Broder launched Faux Forever in 2011 following a career as an advertising copywriter in Michigan and New York, with career stops along the way in fashion styling, public relations and animal rescue. Inspired by her love for animals, Faux Forever is a line of luxurious faux fur accessories including hats, headbands, scarves, shrugs and capes. Fran’s mission is to create a brand that promises luxury with no harm. Brenda Geiger’s journey began as a young girl watching her grandmother create clothing without patterns or designs. Years later those childhood moments inspired Brenda to create her own designs, patterns and a small clothing line. Today, Brenda works in leather and uses her metalsmithing skills to create custom bags and purses in a classic style with a modern twist. Arlene Lullove is a fiber artist who creates one-of-a-kind knitted, woven & felted silk scarves and hats. Arlene is a former owner of Blinds & Designs, Inc., a wholesale fabricator of blinds, shades and shutters. She spent her career creating and manufacturing commercial textiles for the window treatment industry. Her expertise in textiles fueled her passion for wearable art in a variety of mediums. Arlene’s silk & wool designs have been featured in exhibits at the Birmingham Bloomfield Art Center. Her textile apparel and accessories are in private collections throughout the United States. Kathy Mamat is a professional jewelry designer with 25 years of experience and owner of Kathy Mamet Designs, a new studio located inside Glamour Puss in Franklin, Michigan. Kathy designs, sells and repairs one-of-a-kind Jewelry. Her unique works have been featured in Beadwork Magazine, Bead Style and Beader’s Stash: Designs from America’s Favorite Beadshops. Diane Mondry entered the fashion business as a buyer for Marshall Fields in Chicago, but is best-known for her boutique “Diane M.”, in Birmingham, Michigan. Diane M. Jewelry Collection creations are renown for their chic yet understated elegance women enjoy owning and wearing. Abby Stybel, a graphic designer and proprietor of Rebel Soul Apparel, creates one of a kind up-cycled t-shirts, sweatshirts and jackets and other apparel. Her unique creations are sold online and in boutiques. Abby co-owns Eventive Studios, a graphic design firm. Laurie Winston is a jewelry and accessories artist whose expertise in knitting, crocheting, mosaic and needlepoint enables her to collect and research materials and crafts from around the world. She creates unique beadworks in all mediums that may be worn or displayed. Lauri may be best known for her vintage and antique beaded purse designs and patterns. Her collection of antique frames and vintage beaded designs has been on display in many Florida art shows. She lives in Michigan and Florida, shopping for, collecting and creating wearables for sale for many fundraising shows. Shifra Zeiler has worked with clay as a ceramic artist for more than 18 years creating decorative, functional, and Judaic hand-built and wheel-thrown pieces. Throughout the year Shifra teaches art to children and young adults with special needs. She runs a pottery workshop at Camp Simcha/Chai Lifeline. © Jewish Hospice 2019. Theme designed by CPOThemes.